Severe air pollution happened frequently over the Beijing-Tianjin-Hebei (BTH) region in recent years, which attracted the public’s great attention. Organic aerosols (OA) are one of the most important components of fine particulate matters (PM2.5), constituting 20%-90% of PM2.5 mass in the northern hemisphere. During haze days in winter, O3 concentrations were relatively low in BTH region, revealing the limited atmospheric oxidation capacity. The formation pathway of OH (formed from O3 photolysis) reacting with volatile organic compounds (VOCs) was thought to be the major formation pathway of secondary organic aerosols (SOA) traditionally. Low O3 concentration during haze days did not favor SOA formation. However, SOA contribute 44%-71% of OA mass during haze days, indicating that there may have other factors enhancing SOA formation during haze days. The research group of Prof. LI Guohui from Institute of Earth Environment, Chinese Academy of Sciences used the WRF-Chem model to simulate SOA formation during a severe haze pollution episode in January 2014. The model results showed that heterogeneous HONO formation greatly enhanced SOA concentration by 46.3% over BTH region. Fig.1 showed that including heterogeneous HONO sources in the model increased the simulated HONO concentration in Beijing by 0.7 ppb, with better agreement with the observation. The simulated SOA concentration considering heterogeneous HONO formation was increased by 3.3 μg·m-3, which only underestimates 0.4 μg·m-3 of SOA mass, compared with the measurement. Further analysis showed that the irreversible uptake of glyoxal and methylglyoxal (HSOA) contribute 8.5% to total OA mass under non-haze conditions to 30.2% under haze conditions, revealing another important pathway for SOA formation during haze days. Glyoxal and methylglyoxal in the atmosphere came from the primary emissions from residential sources and the oxidations of VOCs. Fig.2 showed that the primary emissions of glyoxal and methylglyoxal from residential sources dominated HSOA formation, contributing 25.5% of OA mass over BTH region, while the secondary HSOA (formed from the oxidation of VOCs only contributes 2.1% of OA mass over BTH region. 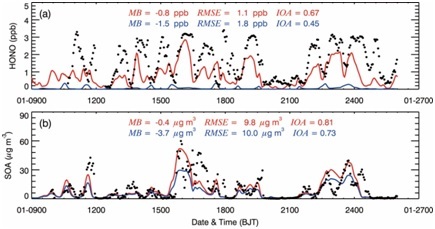 This research highlighted the great contributions of heterogeneous HONO sources and the primary emissions of glyoxal and methylglyoxal from residential sources to SOA formation during haze days in BTH. This work has been published on Atmospheric Chemistry and Physics.